U.S. 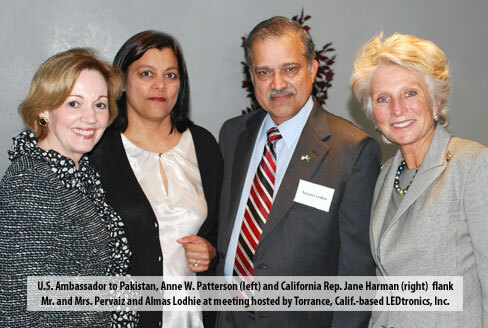 Ambassador to Pakistan, Anne W. Patterson, and Rep. Jane Harman from California’s 36th District joined a group of about 20 prominent Southern California Pakistani-American community leaders. Torrance, Calif., March 25 — U.S. Ambassador to Pakistan, Anne W. Patterson, and Rep. Jane Harman from California’s 36th District on March 5 joined a group of about 20 prominent Southern California Pakistani-American community leaders in a gathering to discuss U.S.-Pakistan bilateral relations and issues relating to trade, education and health. Pervaiz Lodhie, president and founder of LEDtronics, Inc., hosted the meeting at his Torrance company and moderated the two-panel discussions. A pioneer in the design and manufacture of light-emitting diodes, LED lamps, indicators and other lighting products for varied markets for 26 years, the firm has become an industry leader in the booming energy-efficient lighting technology sphere. But it was in his capacity as humanitarian activist and philanthropist that Lodhie undertook the initiative, together with Shoaib Kothawala, president and CEO of International Textile & Apparel, Inc.
“We have to do everything we possibly can, all of us together, to ensure that we maintain true democracy in Pakistan and give the elected government the chance to succeed,” Ambassador Patterson told the select group of Southland expatriates. The attendees included distinguished members from academia, medicine, banking, the media, and electronics, technology and textiles industries. She urged them to be “more active in the political situation in Pakistan,” noting that no civilian government has ever finished its term in the history of the country. Mr. Lodhie inquired the ambassador as to the role Pakistani Americans could play to improve prospects for the government and ordinary citizens in the embattled country. “Key to Pakistan’s turnaround is Pakistanis bringing money back and investing it there,” said Amb. Patterson, who was acting U.S. Ambassador to the United Nations in 2005 and has served as U.S. Ambassador to Pakistan since May 2007. Elaborating on comments made by other participants, Mr. Lodhie bemoaned the lack of organized political advocacy on the part of the Pakistani American community and the need for joint effort and fund-raising. “Being here 50 years, this community is really at the beginning stage of realizing that when it comes to a collective need, that we have to be heard in Washington, D.C., through people such as Congresswoman Jane Harman,” he said. In the segment devoted to education and health, Amb. Patterson pointed out the dichotomy between Pakistan’s development of advanced weaponry and the inadequacy of resources devoted to the most basic of social needs. “It’s the lowest percentage of education and health expenditure on the planet,” she remarked. Mr. Lodhie concurred. “Unless you have the masses get basic education... children from these villages that have never gotten the opportunity to go to school will never become the scientists, the pioneers and the entrepreneurs that the country desperately needs,” he said, emphasizing the need to establish a top-down foundation of education from kindergarten to higher education. For almost 10 years, Mr. Lohdie has been going back to his ancestral homeland, where he has established educational projects, donated solar panels, water pumps and low-energy LED lighting to remote villages as well as the 2005 earthquake survivors. In 2003, the California businessman and engineer initiated a philanthropic program for the socio-economic development of Pakistanis who live below the poverty line. Also in attendance were Congresswoman Harman’s chief of staff, John Hess, and ex-Congressman Jim Moody, along with Salim Adaya, Danish Gajiani, Sattar Abbasi, Aiesha Ghauri, Aitezzaz (Bob) Din, Adnan Khan, Fiza Shah, Shezad Rokerya, Tariq Chaudhary, Arif Mansuri, Ghazala Khan, Salman Naqvi, Yousuf Shaikh, Hasan Shirazi, Salim Iqbal and Asim Ashray. Founded in 1983, LEDtronics is a leader in designing, manufacturing and packaging state-of-the-art LEDs to meet the world’s constantly changing lighting needs. The product line encompasses an array of direct incandescent lamp replacement based LEDs; low-cost, snap-in and relampable panel mount LEDs; high-intensity, sunlight-visible discrete LEDs; PCB LEDs; circuit board status indicators; surface-mount diodes, SMT LEDs, full-spectrum RGB LEDs, and Infrared (IR) LEDs.